Have the attitude of experimentation and creativity when you start painting. You will create something new and unexpected. Remember you have unlimited capacity and potential and you can exhibit it in most appealing manner. Instead of only pink, select the paper in non-conventional colors i.e. cream, brown, grey or blacks because these may be more appropriate and impressive. 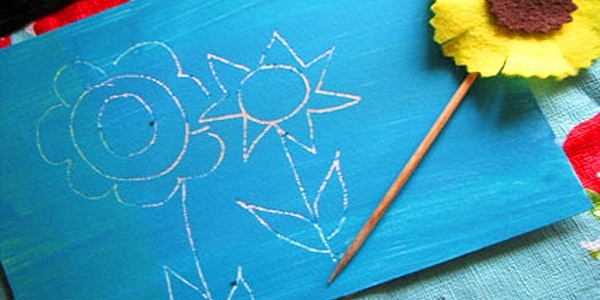 Use light medium colors of pencil or pen to draw on dark color paper. This creates a different and unique presentation. You can glue the handmade textured papers and paint them over. It will create something new and more exciting. This is not so costly but your creativity will be explored to a greater extent. You are well aware that tracing paper is not only useful for tracing but also an exciting drawing surface. So, use tracing paper to make translucent overlays or glue onto white backing paper. Its shiny surface creates glossy and rich images. Your art project will deserve appreciation. Be careful while doing it because the pattern may dominate and overpower your work. When you select appropriate images, you will get excellent drawing surfaces or collaged material on patterned items. It is relatively a new idea, but if you wish to experiment the drawing on newspaper, the texts written on it also become the part of your works. You have to take it as intentional and considered decision. Keep the messages contained within the writing as relevant and non-distracting. If you have to send your art project work, draw on a cardboard. It is of lightweight and can provide a robust base for a painting. If you glue the cut-outs of cardboard into a work, it creates an elevated surfaces with the of composition of depth and shadows. Take the pieces of fabric, cut and glue them on paper and paint. You can paste the fabric on the hardboard and paint on it. Modelling compounds are used for creating thick and sculptural elements in an artwork. You can use it in your project with the help of masking tape to create straight edged areas or slapped on and scratch erratically with help of stick. You will feel the magic. You can press the items into it and carefully lift them out when dry. It reveals your indented form and pattern. You may also sand it and cut with a craft knife when dry. Ti is assured your project will be unique and appealing. Don’t hesitate to put all your imagination on canvas or paper. Just create an assembly of objects which are not normally used in making art. If your art project is intended for shipment to a foreign country for the purpose of assessment, consider the custom laws in vogue. So, make your art project light in weight, small in size and cost effective.